Religious Education strongly contributes to the development of spiritual, moral, social and cultural education. It develops skills of empathy, respect and tolerance. It also promotes citizenship, literacy, numeracy, the understanding of social responsibility and what it means to be human. By the end of Key Stage 3 students will have considered how a number of religious beliefs and actions affect the lives of the believer and those around them. We learn about how faith, beliefs and values can influence people’s decisions about real life issues such as respect, the environment and beliefs about the afterlife. Students are given the opportunity to listen to and understand varied points of view surrounding a topic allowing them to develop an open mind and explore their own beliefs and values. They are encouraged to express their own opinions in a reasoned way and justify them as well as develop the skill of understanding the views of others. 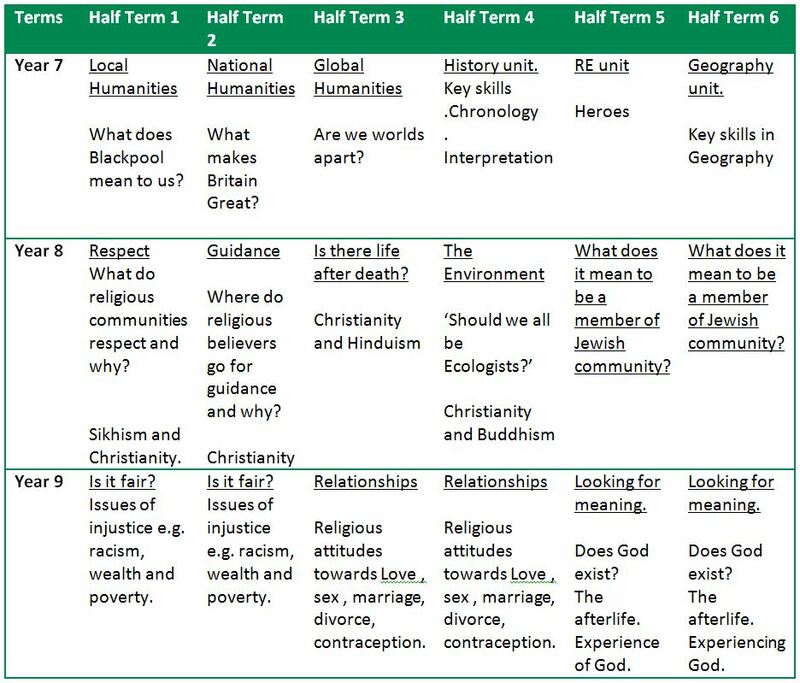 The major world religions of Christianity, Judaism, Sikhism, Hinduism, Islam and Buddhism are all studied at KS3 so that students have an awareness and understanding of the main faith groups that exist in our world. The skills developed in Key Stage 3 are essential for students who follow the two year WJEC GCSE RE course. The aim of this course in Religious Studies is that it should encourage learners to be inspired, moved and changed by following a broad, satisfying and worthwhile course of study that challenges students and equips them to lead constructive lives in the modern world. Wider reading, extra-curricular activities and trips are encouraged to develop student’s understanding of the historical processes and concepts.